Fair. Box shows moderate A book in readable condition--All of our items have years of enjoyment left in them. It MAY contain writing or highlighting on pages, The cover may show wear and tear, and or stickers/residue. Fast Shipping-Monday to Friday in Safe and Secure Bubble Mailers! New. Trade paperback (US). Glued binding. 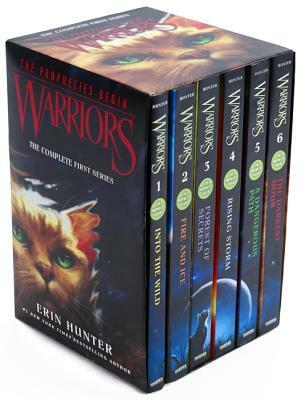 2112 p. Warriors: The Prophecies Begin. Intended for a juvenile audience. Very Good. 0062367145 Minor shelf wear. New. Trade paperback (US). Glued binding. 2112 p. Warriors: The Prophecies Begin. Intended for a juvenile audience. In Stock. 100% Money Back Guarantee. Brand New, Perfect Condition, allow 4-14 business days for standard shipping. To Alaska, Hawaii, U.S. protectorate, P.O. box, and APO/FPO addresses allow 4-28 business days for Standard shipping. No expedited shipping. All orders placed with expedited shipping will be cancelled. Over 3, 000, 000 happy customers. New. 0062367145 BRAND NEW, GIFT QUALITY, DIRECT FROM THE PUBLISHER! NOT MARKED UP REMAINDERS OR DINGED AND DIRTY OVERSTOCKS!